Eagle Creek Estates Eagle Creek Homes: Exclusive one-of-a-kind opportunity to own a two-home family compound perfectly secluded on an acre of the lush preserve in Naples. Imagine living in this luxury home while enjoying the ultimate property for entertaining & hosting the entire family. This 7 bed, 8.5 bath luxury residence is comprised of two gorgeous homes on a triple lot, that encompasses over 6100 Sq Ft under air & 5900 sq ft as lanai & under roof outdoor living spaces. Two heated pools + spa with traditional Saltillo tile. The main home features built-in luxurious entertainment center, wet bar, a study that opens up to the screened solarium, a master bedroom with French doors that overlooks one of the two pools, the main house kitchen that inspires with top-tier appliances & stunning granite with breakfast bar. The second home features granite and huge island in the kitchen that overlooks a great room with gas fireplace & FOUR master-size bedrooms each with their own full bathrooms. Also: full outdoor kitchen & tavern, poolside casita, fire pit, garages for 4 cars & more! This is a unique opportunity in the award-winning community of Eagle Creek. Eagle Creek Estates Eagle Creek Homes: Updated gorgeous custom built open floor plan home with an expansive lanai, mansard screen enclosure and panoramic screening that overlooks the golf course. Mahogany French doors open to the foyer with custom lighting and an inviting entryway. The formal dining room boasts a custom chandelier. The living area and the kitchen are open and inviting with warm tones, volume ceilings, tile woodlike plank flooring and open to the large lanai outdoor living area. The kitchen is magnificent with leathered granite countertops, a large custom island, gas cooking with dual fuel range, custom built-in cabinetry with a built-in coffee center, wine cooler, stainless steel professional appliances, and Italian tile backsplash with custom vent hood. The family room is cozy and warm with a built-in fireplace. A peaceful master retreat is open to the lanai and features a custom walk-in closet with cabinetry. The en-suite has a large frameless glass shower. Two more bedrooms and baths for your guests, interior laundry and more. The outdoor area features a kitchen and a large screen enclosure. Please see the feature sheet for many more details on this magnificent home. Eagle Creek Homes: H.13776 - Exquisite custom remodeled home in Creek Bed Estates. Overlooking 16th fairway and green, this 3 BR / 2.5 BA residence boasts open living concept with travertine marble floors through main area and master bedroom. Second guest bedroom was redesigned into an office space with doubled closet size, custom cabinets, added storage area above closet, barn doors, library ladder and a Murphy bed. The expanded kitchen is open to primary living areas and features custom cabinets, granite countertops and stainless appliances. Large master suite has luxurious bath with onyx countertops on dual vanities (bowl sinks with waterfall faucets), tumbled marble floors, step-in shower and soaking tub. The spacious lanai features power storm shutters and overlooks panoramic screen-enclosed pool with marble decking. Eagle Creek is a friendly country club that offers championship golf, active tennis and bocce programs, state of the art fitness center and a beautiful, remodeled clubhouse. Eagle Creek is Naples' best kept secret! Eagle Creek Homes: H.14299 - From the first step in the front door, you will appreciate how beautifully decorated and furnished this gorgeous home is, right through to the inviting sparkling swimming pool. The large master suite is thoughtfully separated from the 2 guest bedrooms, with access to the 12 X 16 covered lanai which extends out to the spacious pool deck. The kitchen offers raised paneled cabinetry and corian counter tops. This 2,061 Barrington single family home boasts 3 bedrooms, plus Den, sitting in a serene setting in the heart of exclusive Eagle Creek Golf & Country Club. The oversized laundry with tons of storage includes a desk which can be used for crafts, gift wrapping or as a private computer desk for guests. Convenient 10 minute walk to the warm and friendly clubhouse, driving range, community pool and state of the art tennis and fitness center. If you enjoy the availability to walk a beautiful 18 hole championship golf course then Eagle Creek is where you want to be! This exclusive club has 460 residences set on 300 acres of mature landscaping, close to shopping, pristine beaches and fine restaurants. Golf Membership is required with the purchase of this beautiful home. Eagle Creek Country Club Eagle Creek Homes: You will love this spacious, 3 bed 3 1/2 bath home located in the active community of Eagle Creek Golf & Country Club. This home is light and bright and ready for you to move in and add some of your own touches. The kitchen has Stainless Steel appliances, white cabinets, with granite counter tops. Enjoy the large first floor master with upscale master bath suite. Plenty of walk-in closets and built ins and volume ceilings throughout. The large loft is perfect for visiting family & friends. Eagle Creek Golf & Country Club has a 18 hole golf course and 7 har tru tennis courts with an active lifestyle for all. 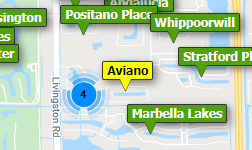 Conveniently located 15 minutes to Marco Island or 15 minutes to downtown Naples! Don't miss out on seeing this one! Eagle Creek Homes: H.13612 - Immaculate Single Family Pool Home! Bright open floor plan offers tray ceilings and lg tile and wood flooring, nicely decorated in soft Florida colors. The kitchen has been updated with granite countertops and raised panel cabinetry. The split floor plan offers privacy for you and your guests. Step out on your covered lanai and pool deck with your favorite morning or evening beverage. You will enjoy entertaining family and friends around the sparkling pool. Ready now to enjoy Eagle Creek’s Country Club lifestyle. Just a short walk to all Eagle Creek’s fine amenities. If you enjoy the availability of walking a beautiful 18 hole championship golf course, playing tennis, bocce, taking yoga, Pilates, and fitness classes then Eagle Creek is where you want to be! Eagle Creek is a warm & friendly community with only 456 residences set on 300 acres of mature landscaping, close to shopping, beaches and fine restaurants. Golf or Social Membership is required with the purchase of this immaculate home. Eagle Creek Homes: Former model home built in 2005, but lived in for only five months. Neutral colors, stylish furnishings, new window treatments and lighting fixtures, two-car attached garage. Pool converted to salt water in 2018 with new heater/cooling system. Cement block construction and hurricane impact sliders and windows, safe and secure community, all add to peace of mind in idyllic location. The Crestwood neighborhood is just steps away from Eagle Creek's great tennis, bocce, fitness, pool and dining facilities. Eagle Creek is a low density community that affords golfers the ultimate in access and enjoyment. Either social or golf membership in club is required. The golf memberships max out at 360 members to assure each member gets the most usage out of the course. This pool home is a light & bright oasis and makes for the ultimate in privacy and comfort. House is like new - with great negotiable furnishings! Eagle Creek Villa Homes Eagle Creek Homes: Spacious attached villa in "The Keep" highly sought after section of Eagle Creek Golf and Country Club. This residence lives like a single-family home and offers three roomy bedrooms, three full baths, a comfortable great room with dining area, an ample eat-in kitchen, breakfast bar with pass-thru, master bedroom with en suite bath, full size laundry room, in-ground heated screened pool with a generous under-roof area, wonderful views of the perfectly manicured golf course and a two car attached garage! Eagle Creek Country Club is a 24 hour secured guard gated community with an intense amenity level including championship golf with walking permitted at any time, a 2,000 square foot lodge-style clubhouse with dining, a Junior Olympic size community pool, hot tub, Har-Tru green clay tennis courts, fitness center, pro shop, online tee time system, off season Reciprocal Golf Program and a 3 acre natural preserve! The community is perfectly located equidistant to Naples and Marco Island Beaches, just minutes to terrific restaurants, entertainment, shopping, downtown 5th Avenue and 30 minutes to Fort Myers International Airport. Owners are permitted 2 pets with approval up to 25 pounds. Eagle Creek Homes: This amazing 3/2 single family home w/ 2 car garage in Eagle Creek Golf & Country Club has been beautifully remodeled to include a BRAND NEW ROOF, freshly painted interior, new kitchen w/ granite counters, new stainless steel appliances, & completely brand new bathrooms (toilets/ tub/ shower/ fixtures/ etc). One story floor plan features vaulted ceilings, a separate breakfast nook, large laundry room w/ sink, a triple split floor plan, & plenty of closet space! Master suite includes a large walk in closet, separate sitting area, direct access to the rear screened patio, & an amazing en-suite bathroom w/ a separate built-in garden tub, large shower, & double sink vanity. Picturesque garden views from the oversized, covered, screened patio, includes a sunk-in hot tub for those cool winter evenings. All furnishings included. This rarely available home is featured at an amazing price! Eagle Creek features a championship golf course, state-of-the-art clubhouse, multiple swimming pools, tennis courts, Pro Shop, multiple restaurants, resident activities, etc. As of the date of this listing, Eagle Creek is offering either social memberships (25k initial) or golf memberships (45k initial). Eagle Creek Homes: V.2810 - A stunner! Completely remodeled villa in the unique golf community at Eagle Creek. Looking for the WOW factor? This home will not disappoint. The 2 bedroom + den villa boasts gorgeous wood-look tile throughout. The home features an open concept living area with vaulted ceilings and skylights. The gourmet kitchen has all the upgrades: granite counters, tile backsplash, SS appliances and two toned raised panel cabinets. The master and guest baths impress with walk in showers and marble counters. Master bedroom features a walk in closet and access to the paved courtyard. The spacious lanai with SW exposure and wet bar is a great place to relax with a beverage and watch the sunset after a long day on the golf course. Room to add a pool if so desired. Eagle Creek Golf & Country Club is a private, gated community, perfectly located between the beautiful beaches of Naples and Marco Island, downtown dining, access to airports all within easy reach. Limited Membership translates to daily play of golf & tennis, a stunning, truly walkable, 18 hole championship golf course, immaculate 7 har-tru tennis courts and 3 grass bocce courts. Social or golf membership is required. Eagle Creek Villa Homes Eagle Creek Homes: Seller says to "Bring an Offer" to live the Florida lifestyle in this elegant 3-bedroom, 2-bath rarely lived in home with expansive golf course views seen from the spacious screened lanai. The great room floor plan with vaulted ceilings creates a feeling of openness. There is a detached 2-car garage that completes this package. Eagle Creek Golf and Country Club is a private community located on 300 acres of natural beauty in Naples. With just 460 total residences and all the amenities of a much larger community. This 18-hole championship golf course and tennis and sports complex offers Har-Tru tennis and bocce courts, a Junior Olympic sized pool, tennis pro shop and fitness center that offers classes in aerobics, water aerobics and yoga. Social or golf membership is required. This is where you want to live and play. Eagle Creek Villa Homes Eagle Creek Homes: PROPERTY BACK ON MARKET !! NEW ROOF INSTALLATION ONGOING (tile on backorder) Roof has been paid for . Volume ceilings highlight golf course view accented by sunset western exposure from lanai. This elegant 2 bedroom villa lives like a 3 bedroom unit with the hideabed sofa in the living room. Kitchen has been updated with custom glassed cabinets. Front private gated fenced area leading to screened entrance is absolutely perfect for pets. Living room features built in white shelving facing sofa & coffee table which coordinates with the white bar. Custom mirroring over bar and behind dining room creates spacious reflection. Utility laundry room connecting garage & kitchen is home to a Duet whirlpool oversized washer & dryer. NOTE: Call listing agent for updates. Need professional assistance selling your property at Eagle Creek Naples? Find out how an Area Specialist can help to generate more property exposure in order to get the most money for your investment in the least amount of time.